Sunderland AFC look to close the gap on Barnsley in the League One automatic promotion race when they face Accrington Stanley in a ‘David vs Goliath’ clash at the Wham Stadium. Sunderland will look to respond after defeat to Portsmouth in the Checkatrade Trophy final at Wembley, where they lost 5-4 on penalties following a 2-2 draw after extra time. 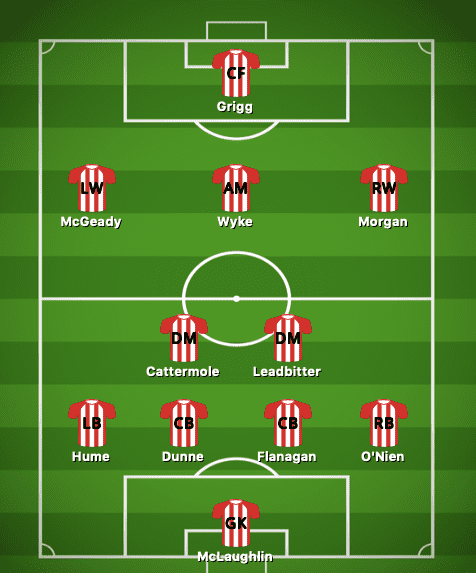 In the reverse fixture at the Stadium of Light Accrington lead 2-0 before goals from Black Cats captain George Honeyman and Aiden McGeady salvaged a 2-2 draw. Accrington will be looking to improve on recent outings having lost four of their last five in League One, but will be confident after two good showings against the Black Cats earlier in the season. Adam Matthews remains out having missed the previous game at Wembley with a recurring ankle injury. George Honeyman will be unavailable for the game against Accrington as he serves the final match of a three-game ban following a red card he picked up against Wycombe. Duncan Watmore and Chris Maguire remain unavailable, but Ross hopes to have Maguire back for the game against Coventry. The Black Cats also have one or two other doubts, who will be assessed over the next 24 hours. One of those doubts is striker Will Grigg, who continues to struggle with an ankle injury picked up while at previous club Wigan, and lacks general fitness having hardly trained due to this ongoing issue. However, Donald Love will be back available with Sunderland manager Jack Ross confirming he is back to full fitness. Sunderland will want to bounce back from the disappointment at Wembley and close the gap on Barnsley, with changes expected to their side after playing 120 minutes in the final last Sunday. Accrington will look for the upset and will be up for the clash, while trying to pull away from the 13-team relegation battle. But the Black Cats will want to let their frustrations out after the weekends disappointment and even with changes expected should have enough to hand.